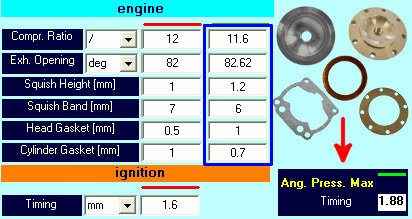 for the presentation SET-UP TWO STROKE is the universal software for optimal tuning of all 2-stroke engines. It lets you quickly to optimize carburetion, ignition timing, spark and transmission ratio, when change, the weather conditions, the compression ratio, the height of squish, the squish band, the exhaust opening angle and the gasoline used. The software SET-UP TWO STROKE is very simple and intuitive, and can be used both from rookies, both from technician more expert. In fact gives both immediates results useful to make the main settings, both technical results that allow additional step of fine tuning. In the software you must enter some technical features of the engine, the main settings that you're using for carburetion and ignition, and the informations concerning the gasoline and the oil percentage that comes used. 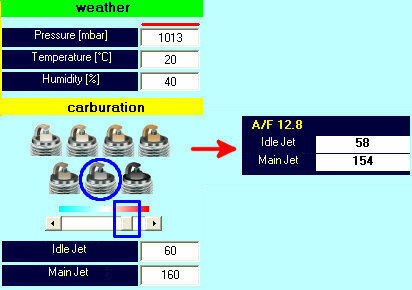 In addition at these main functionality the software performs also an ENGINE ANALYSIS when change the weather conditions or when you make technical modifications or of set-up, and this allows for example to find others interventetions on carburetion and ignition to optimize the EXHAUST TEMPERATURE or the COMBUSTION, and to contain the KNOCK or the THERMAL EXPANSION. 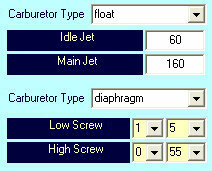 The software gives the indications to set every type of carburetor, both with float, both with diaphragm. For the floating carburetors is sufficient enter the venturi diameter, while for the diaphragm carburetors in addition to this, must be entered the throttle diameter. For the carburetors with float the software gives the indications to modify the idle jet and the main jet, while for the diaphragm carburetors the setting of low and high screws. As mentioned the software can be used, both to optimze the carburetion, both to keep optimal the carburetion when change the weather conditions. In fact if after your session on track you've seen that your carburetion isn't optimal, entering the weather conditions and selecting how seem to you the carburetion or the spark, the software will help you to correct the carburetor setting in the optimal direction. 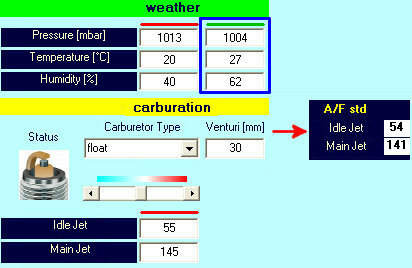 If instead you've already found a carburetion that has allowed you to have the best performance for the engine, will be sufficient enter in the software the weather conditions that you had when you've used these settings, and entering the new weather conditions the software will tell you immediatly how modify the carburetor setting to keep it again optimal for the new conditions. Same speech for the ignition timing, in fact if you couldn't to find the best ignition timing of your engine through dynotest, the software will give you the indications on which should be the optimal ignition timing based on the characteristics of your engine. 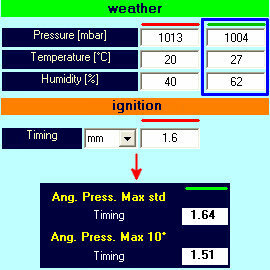 If instead you've already found the ignition timing that allows you to have the best performance for your engine, will se sufficient enter in the software the weather conditions that you had when you've used this ignition timing, and entering the new weather conditions the software will tell you immediatly how modify the ignition timing to keep it again optimal for the new conditions. An other feature very important of the software is the optimization of the ignition timing when you change the head of the engine, or when you change the cylinder and head gaskets to modify the squish, the compression ratio, and the port timing. In fact these interventions are very frequents in the tuning of the engine, and significantly affect the combustion, therefore is essential to quickly optimize the ignition timing to obtain the best performance and avoid breakage. SET-UP TWO STROKE also allows you to see if the heat range of the spark plug remains adequate or whether is appropriate to modify it. It also determines how to optimize the spark gap in the new conditions to have the best combustion. As you have seen from these few lines, thanks to the software SET-UP TWO STROKE, having an optimal engine fine tuning in all the conditions is not only easy and fast, but it allows you to intervene on all the factors influencing the performance. In fact often the mechanics only works on the carburetion, but over a season when the weather conditions are the most varied, or if you make changes to the engine, to change the ignition timing, or the spark plugs may be crucial to achieving the best performance respect to the others competitors.